We participate in Health & Wellness Fairs when they are free and when we can attend economically. We had learned about the First Brookings-Harbor Health Fair in 2006 to late to apply. However, we went to the fair and found it totally lacking in specific health information for men. And, while there were opportunities to ask some specific questions about men's health, one had to step up and announce to those around him that he had a health issue. That wasn't fair to men. So, in 2007 we applied but were rejected by the committee because, while we were a not-for-profit and provided a major health information service, we didn't have a brick and morter business that someone could walk into and purchase services. So, we were rejected from participation in the 2007 Bookings-Harbor Health Fair. Expecting that not much had changed from 2006 in finding male-specific health information, we decided to hold our own Men's "mini" Health Fair (See www.menstuff.org/brookings/healthfair.html . While our health fair didn't start until 1:30pm in the afternoon, I perused the city's health fair. The American Cancer Society was there and had several brochures on male-specific cancers (prostate and testicular). Of the 40-some remaining exhibits, I found only one brochure (and I had to ask since it was really combined with women on suggested health checks.) It did mention prostate cancer. Other than those brochures, there was nothing that addressed male specific health issues. Nothing on erectial dysfunction, eating disorders, depression, the dangers of dip, reproductive health, breast cancer - and the list goes on. Our experience in 2007 led us to do a 2nd year with the Men's mini Health Fair. We found that the more private discussion versus the circus atmosphere of the larger health fair, served men better. On August 17, 2004 we and the Curry Breast Health Network had booths at the annual required health exam day for those children in the area who plan to participate in school sports during the coming year. We talked to most of the young men during the four hour period about Testicular Cancer and gave each one a Self-Exam shower card for their use. We were invited to set up our booth at the annual meeting of the Coos Curry Electric Cooperative in Port Orford, CA in 2005. We were invited to do it again in 2006 but had a date conflict. Earlier in the year, The Mill Casino in North Bend told us that they wouldn't be doing the health fair this year. However, by late summer, someone came along to sponsor the fair but it was too late to reschedule what we had booked during that time. They didn't hold a health fair in 2007. This was our 4th year at The Mill Casino. Again, our emphasis was on Prostate and Testicular Cancer awareness. The Health Fair attracted 63 exhibitors and over 400 visitors. We're back for a third year. Our theme this year supports our menatrisk.org web site which concentrates on discussing unnecessary risks that attribute to the cause of death for men. The result: men die an average of five years earlier than women. And, with simple lifestyle changes, over 275,000 men's lives could be saved each year. We also presented a continuous showing of the video "Testicular Cancer and the Importance of TSE" (Testicular Self-Exam). Our "Get a Grip! campaign is beginning to gain awareness and health educators are beginning to setup showings for middle-school and high-school boys to teach performing a self-exam and the importance of doing it monthly. This year we placed our emphasis on our Get a Grip! awareness campaign involving Testicular Cancer. "Get a Grip!" campaign to stress importance of a monthly testicular self-exam for young men starting when they reach puberty. Kei Billington, the Casting and Development Administrator for The Mill Casino in North Bend, Oregon, organized a Health Fair for its employees and people from the community. This was a very well organized event, especially since this was their first venture into this arena. They used their bingo hall, which was dark on Monday and Tuesday, and did a commendable job. 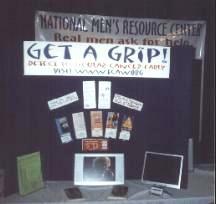 The National Men's Resource Center - "Real Men Ask for Help!" We were located in front, right behind the American Cancer Society booth. Our setup included giveaway materials on prostate and testicular cancer, our "Know Fear" and "No Fear, No Tears, Die Numb" T-shirt transfer, "I am special", "Happy to Be Just Me", "Love Comes in All Colors", "Kids are Special People", "I'm High on Health", and "Hugs not Drugs" stickers for the kids, a pamphlet "Every Man Should Know About His Prostate" and "Answer 8 easy questions to help your doctor help you", and a video of "A Gathering of Men" with Robert Bly and Bill Moyer's going. We had Slide Guides that ask and answer pertinent questions on various topics such as "Men's Guide to Health Tests & Screenings", "Sexually Transmitted Diseases Education Guide", "Facts on Gangs: What every citizen should know", "AIDS Education Guide", "Safe Dating Guide", and "Facts about Prostate Health" and a Testicular Cancer Self Exam Shower Card. Plus, "Make the world safe for children" and "Practice Random Acts of Silliness" bumper stickers and our special "Time Out" heat sensitive stress indicator as well as the website set up on dual computer screens so people could pick out information they wanted and print out a take-home copy right there. We also had rubber replicas of a healthy prostate and five others representing the feel and texture of an enlarged cancerous prostate, and enlarged prostate, possible cancer, and enlarged prostate BPH, a normal size prostate with a hard nodule, possible cancer, and an enlarged prostate, BPH or possible cancer. For those who might consider doing a self-exam, this gave them a sense of what they might encounter. We felt the Fair attracted a good number of locals as well as a substantial number of employees from The Mill. We will continue to exhibit at more fairs like this in the future! 1. Display teaches about the prostate and prostate health. 2. General information on men's health and other men's issues. Real men ask for help!